A hundred cub scouts have been banned from holding a protest meeting in the House of Commons because they are not old enough to vote, MPs claim. 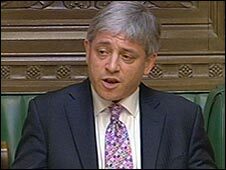 Commons Speaker John Bercow is being urged to step in after the Westminster Hall booking was cancelled by the Commons authorities. Labour MP Martin Salter said: "All constituents, regardless of age, should be free to lobby their MPs." The scouts want to protest about a rise in water charges for voluntary groups. Mr Salter has joined forces with Labour colleague Stephen Pound, co-chair of the all-party group on Scouting, and Tory MP Julian Brazier, chair of the of the all-party group on Adventure and Recreation in Society, to call for the ban to be overturned. The three MPs have sent a joint letter to Mr Bercow asking him to intervene and overturn the decision. The letter says: "The House authorities have withdrawn permission on the ground that they are not yet eligible to vote. "This is unacceptable as all constituents, regardless of age, should be free to lobby their MPs." Mr Salter has also tabled a cross-party Early Day Motion calling for the ban to be reversed. The Reading West MP, who organised Mr Bercow's campaign to be Speaker, said: "Once again the House of Commons has shown what a deeply conservative and out of touch institution it is capable of being. "On the one hand we have an excellent Parliamentary Education Unit which actively encourages the engagement of schools and young people. "However, yet another arm of this arcane bureaucracy appears to be doing all it can to slam the door in the face of the young people from the Scouting movement who simply want to press their case with their Members of Parliament." The Scouts are campaigning against planned changes in the way water companies charge community groups in England and Wales for the disposal of rainwater. They face paying hundreds of pounds for a service which is currently free to many of them. Water companies have been asked by the water regulator Ofwat to look at changing the way they charge for treating surface water. Instead of rateable value, it wants water companies to base their charges on the surface area of the roof and any other hard surface like paving or car parks, which it says is by far the fairest approach. The watchdog says the cost of providing surface water drainage in England and Wales is about £700m each year. But campaigners against the so-called "rain tax" say it could leave many organisations out of pocket or facing closure. Stella Creasy, head of public affairs and campaigns at the Scout Association, said: "The cubs want to come to parliament as part of our Stop the Rain Tax Campaign because Scouting encourages young people to value democracy. "That's why its a shame they are not able to lobby their MPs within Westminster Hall. "However, we're grateful for the support of MPs of all parties that we've received and their commitment to helping these young people to have their views heard by their elected representatives - whether they are old enough to vote for them or not." A spokesman for the Commons authorities said he wanted to "establish the full facts" before commenting.